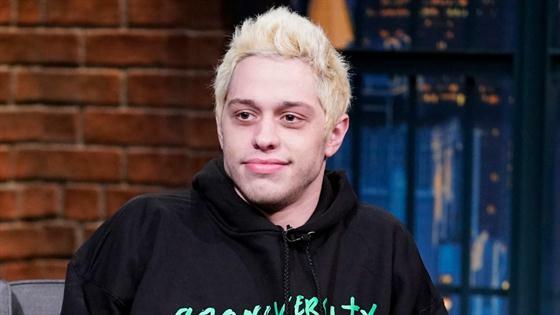 Pete Davidson made a brief appearance in person during the live broadcast of Saturday Night Live, hours after he sparked alarm with a seemingly suicidal note on Instagram. The 25-year-old cast member and comedian, who has been open about his mental health struggles, had deleted his social media account minutes after publishing his post, which had prompting celebs, such as his ex-fiancé Ariana Grande, to reach out to him, and for the NYPD to perform a wellness check following concerned calls from fans. Davidson first appeared in a pre-recorded video sketch about the 2019 Oscarson the show before showing up on the SNL stage after about an hour to introduce musical guests Miley Cyrus and Mark Ronson for their second performance. "Once again, Mark Ronson and Miley Cyrus," he said, smiling slightly and dressed in a festive green jacket over a red Christmas hoodie. Davidson remains off Instagram. Meanwhile, he has canceled at least one comedy show, in Los Angeles. Davidson had posted his alarming Instagram note minutes after issuing a rare comment online in response to a Twitter argument that erupted between Grande and Kanye West. She had tweeted, "Guys, I know there are grown men arguing online rn but Miley and I dropping our beautiful, new songs tonight so if y'all could please jus behave for just like a few hours so the girls can shine that'd be so sick thank u." Grande had released her new single "Imagine" later that day as scheduled. "I know Ariana said this to be cool and didn't mean no harm but I don't like even slightest level of slight commentary from someone I know loves and respects me," West replied. "All of this foolishness weighed on my mental health so @ArianaGrande you know I got love for you but until you're ready to really make sure everyone's ok don't use me or this moment to promote a song." Grande then told West, "With all due respect, I don't need to use anyone to promote anything. Period. I was making a comment ab what men were doing at the time vs. women. It was a joke which I understand now was probably insensitive. I apologize if I was in any way triggering and hope u feel well today." Davidson then weighed in, writing on Instagram, "Bravo Kanye West for standing up for yourself and speaking out against mental health. I can't explain to you enough how difficult and scary it is to be honest about stuff like this. We need people like Kanye. No on should ever point fingers at you for your bravery in speaking about mental health. I'm seriously disgusted." His words sparked a bit of a backlash among Grande's fans. Minutes later, he posted his alarming note and then deleted his account. "Man I'm so sorry I told a dumb joke," Grande later tweeted. "I really didn't mean any harm. All I want everyone to be healthy and happy. So desperately. Please. My god...I'm downstairs and I'm not going anywhere if you need anyone or anything. I know u have everyone u need and that's not me, but I'm here too." When asked by a fan why couldn't she have texted Davidson, Grande tweeted, "No I couldn't because I don't have his number. What else??????????????????? How else would we like to vilify me today? Pls keep going bc I haven't had enough guilt at all." Grande has since deleted her tweets about West and Davidson.